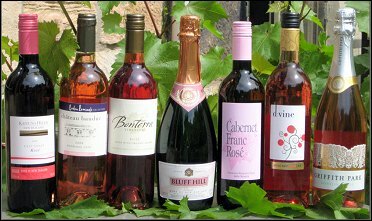 I’ve gathered the latest crop of pink wines together for a seasonal round-up of some of the most interesting examples on UK shelves. It’s good to see that the ever-expanding rosé category is throwing up plenty of interesting wines, from pink Italian Cabernet Franc, to Douro wines made from indigenous grapes, to classic Provence rosés in the delicate and bone-dry style. July seems to be peak season for discounts on rosé too, so happy hunting. Before we go any further let’s get one thing straight: this is a sweet, carbonated, low-alcohol ‘blush’ Zinfandel which comes with a plastic screw-top in the approximate form of a Champagne cork and can be yours for £3.33 in Tesco. There would be absolutely nothing clever or daring about me running it into the ground, so instead let’s accept that it may well sell by the oil-tanker-full to Lambrini girls and consider what it tastes like. Alcohol is reduced by the ‘spinning cone’ method to just 5.5% in a wine with a bright crimsony-pink colour and a fairly neutral nose hinting at strawberries and cream. On the palate the gentle effervescence is refreshing, and though the wine doesn’t taste of terribly much, there’s nothing unpleasant and the finish is close to dry. The current heatwave might just be the perfect platform for a glass or two of this. 79/100. £4.99, Tesco, three for £10 6th – 21st July 2009. This Champagne method fizz from South Eastern Australia is a blend of Chardonnay, Pinot Noir and a dash of Shiraz for colour. It scooped a bronze at this year’s International Wine Challenge, which given it was the least expensive wine in its category was quite a coup. It has a peach down and strawberry softness on the nose, with a lively, creamy mousse onto the palate, where a touch of residual sugar flatters the soft, creamy, strawberry and red cherry notes of the fruit. The acidity is balanced into a gentle, easy drinking finish. 86/100. £6.99 at Asda, Morrisons, but £2.00 off in both until mid July 2009. Grapes are not listed on the label for this Mendocino County wine, though in fact it is a blend of many grapes including Sangiovese, Zinfandel and Syrah. The deepest rosé of the bunch, there’s a note of cranberry and cherry, a hint of spice and a certain tea-like quality. On the palate it is full of strawberry pulp fruit, underpinned by a citrussy acidity and still showing little herbal and leafy qualities. Layered stuff, and note that if there is still some on the shelves by 9th September, Waitrose will cut the price to £5.99. 87/100. £9.99, Waitrose. From Provence, a blend of Syrah and Grenache. Pale, salmon pink colour suggests great delicacy. Bright, focused aromas with some pink grapefruit or orange peel, lemon and a raspberry note. Some spices too, even a hint of chocolate in an intriguing profile. Lovely palate, burst with a clean citrus fruitiness, hints of pomegranate and redcurrant, but plenty of lemon rind fatness and bite, sliced through with precise, crisp, mineral acidity and hints of clove and black peppercorns giving layers of interest. Drink with grilled prawns with lots of garlic, any seafood, but also roasted vegetables – aubergine, courgette, red onion. 89/100. £9.99 at Wine Rack but buy 3 at £6.66. Another Provence Rosé, this one from the Coteaux d’Aix, and a blend of 90% Grenache with 10% Syrah. It has a pale, peachy-pink colour and delightfully fine, delicate aromas suggesting a touch of nettle and some peachy fruit with a just a suggestion of rose-hip. On the palate lovely, dashing acidity drives through the core of this wine, as those dry, curranty, zesty flavours stay crisply defined and deliciously moreish. 88/100, £9.99, Great Northern Wine. Rosé Côtes du Rhône is still relatively rare on the shelves, and this blend of typical Cinsault, Grenache and Mourvèdre pours a deep cherry pink and offers subtle, red wine-like aromas of berry fruit, with strawberry to the fore, and a touch of herby undertone. On the palate it is bone-dry, with a big lemony core of acidity that would cut through mackerel, sardines or other oily fish with aplomb. Quite long and quite stylish. 88/100 £10.99, Hailsham Cellars, General Wine Co, Milford Wine Centre, The Smiling Grape, Handford Wines. This 100% Pinot Noir is very delicate and very pretty, with peach-down and fine red fruit. The palate is focused and refined, with classy length and a blast of herbal character. The highest scoring é of this line-up, but the price is eye-watering. Shouldn’t this be £12.99 or so? The mixed dozen price of £14.39 is getting nearer. 91/100. £17.99 at Oddbins.